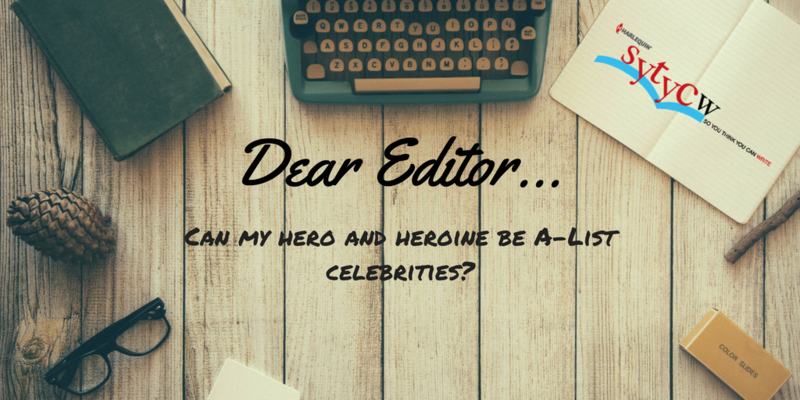 Dear Editor, Can my hero and heroine be A-list celebrities? Can my hero and heroine be A-list celebrities? Our simplest answer is that your characters can be in whatever profession they choose. We can’t control what you want to write. The crucial aspect for a publisher to consider is how this kind of setting – the celebrity world – sells to readers. After all, it’s the reader who chooses and, traditionally, the celebrity story hasn’t often been one that has flown off the shelves. Why? This amateur analyst says that it’s because we’re oversaturated with celebrity in our real lives. Also, it can be difficult for a reader to identify with the blockbuster star heroine or hero. Can this star person really relate to your daily life? Not externally (more on this in a minute). This doesn’t mean that we haven’t published celebrity-focused stories. In fact, there are several titles this editor can’t forget, with smoldering heroes, talented and lovable heroines, and powerful fireworks that happen when these stars collide! Love Me True by Ann Major features a to-die-for mega-star hero who has an Oscar and manages to sweep the heroine off her feet and into the bedroom. That Wild Cowboy by Lenora Worth: This hero is a bad boy in the celebrity world, and you can’t help loving him. His producer isn’t so enamored until she gets to see him for who he really is. The 9-Month Bodyguard by Cindy Dees: A pop diva heroine is in danger, which is doubly unfortunate since she’s carrying a secret baby. Who else but a hunky bodyguard to protect her day and night? As you can see, we don’t discount celebrities. While it’s not what we generally seek, there are amazing authors who can do it justice. So how do you write an effective celebrity character? Add other hooks. Celebrity can’t be the main hook of your story. It probably isn’t one we’d advertise on the cover either. We focus on romance and the themes that directly support them. So, what other hooks are there? Is the character a single parent? From a famous family? Looking for the one that got away? A rancher during his free time (hello, Blake Shelton)? Make the celebrity down to earth. Unless you can write an arrogant celebrity in a fun, charming way, you want the character to be down to earth, someone with good core values who experiences similar hardships/emotions as the reader. A hero who starts off agonizing about whether or not to get a Ferrari or a Bentley might be a turn-off. Know a bit about that celebrity world, but don’t kill us with clichés and details. Avoid the cute little name-dropping moments that make our eyes roll. Use the celebrity as a backdrop. You will want to show the character deep down, not the celebrity itself. The conflict should be relatable. The heroine’s great angst should not be about choosing the right movie project, but instead maybe coming home for the first time in years, difficult feelings of self-worth, having a baby, career vs. love, reversal of fortune in some way, taking a chance on love – conflict we all deal with. Ground the character in honorable traits but also tell us why he/she chose the celebrity world, one which is so focused on image. We often assume that celebrities are self-absorbed so to counter that, show the character as one who relates to the ordinary tasks of life and interacts with others. And at some point, you can give background on why the hero or heroine chose to do this for a living. It’s a part of the story that readers will want to understand. The best celebrity romances in novels and movies are an exercise in contrast. She’s famous, he’s not. He’s in the clouds, she helps pull him down to earth—or vice versa. This helps the conflict. There’s no rule that says you can’t have two celebrities in a romance, but it would be difficult to create enough conflict for the love story to work. My suggestion is to foster more contrast than less between the characters. I hope these tips help on your quest to write that dazzling celebrity story. Again, I must re-iterate that this is not an element we’re aggressively seeking in our editorial, but some lines are open to it. Basically, if you have a fantastic story, we want to read it. I have a plot bunny running around about a famous producer/director and a well known actress. The world thinks they have an on and off relationship but they have been married for ten years. They kept it secret because she was an upcoming actress and she didn’t want people assuming her success came from his influence. Now they are working together again she has decided she’s had enough of the uncertainty. She is pregnant which is something he told her wasn’t what he wanted. Hero is older and was married before and knows how tough it is to make celebrity marriages work. At first he agrees thinking she wants to marry a new lover, proving his indifference but when he finds out about the baby it all changes.